Hello, could you show a proof that Mumble supports 134.4 kbits/s bandwith? Ok i see now, the GUI value is being multiplied by 800. The value should be multiplied by 1000 since you are not converting bits to bytes. The conversion is kbit/s to bits per second. Ie. a slider value of 130kbit/s should result in 130000 not 104000. The mumble client's GUI supports up to "124.8kbit/s" and the murmur documentation says it supports up to 130000 bits per second. I think having the slider max out at 130kbit/s is a good call but the value should be multiplied by 1000 not 800 to get the correct value. David, thanks for the detailed correction. The bug fixed in build 864. P.S. - Nevermind - I just grabbed the corrected build from your website. Thank you again! the mumble client send me this: "Server maximum network bandwidth is only 130 kbit/s. 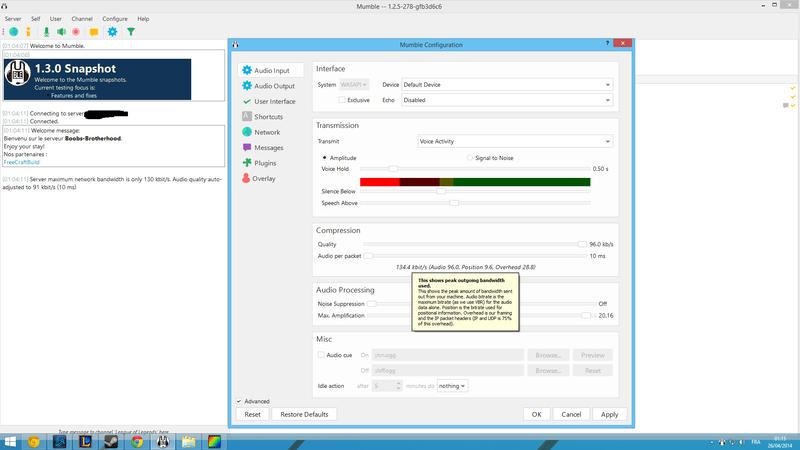 Audio quality auto-adjusted to 91 kbit/s (10 ms)"
So i think you can increase the max bandwith to be sure that audio quality will be not auto-adjusted. Well, I increased max bandwidth value up to 140.